Impress guests and friendly-competition-loving friends with this upcycled glass slash game board. Yep, we're taking the whole "drinking game" thing to a whole other level. 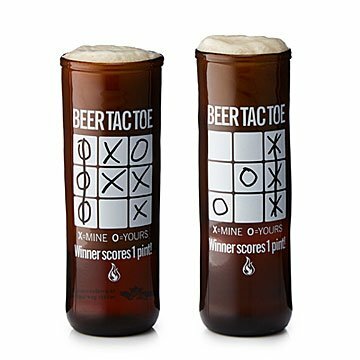 This beer glass turned tic-tac-toe board will earn you plenty of Xs and Os when you give it to a friendly-competition-loving pal, or anyone who's young at heart. Crafted out of dishwasher-safe upcycled glass and with a fully baked-on game board decal, it's ready to provide tons of fun for years to come. Oh, and the marker's included, too. Cheers to that. Handmade in Haliburton Highlands, Canada by Terry Craig and Jennifer Wanless-Craig. Hailing from the highlands of Ontario, Canada, husband-and-wife duo Terry Craig and Jennifer Wanless-Craig both studied glass in college. Terry was a Harbourfront Glass resident in Toronto for two years and has worked at many glass studios throughout North America. Jenn studied fine art at OCAD (formerly Ontario College of Art and Design), Emily Carr Univeristy of Art and Design in Vancouver, and Toronto School of Art. They combine their love for travel and nature to create work that is inspired by glacial and geological landforms. Merging design elements with rich materials to create beautiful modern work.